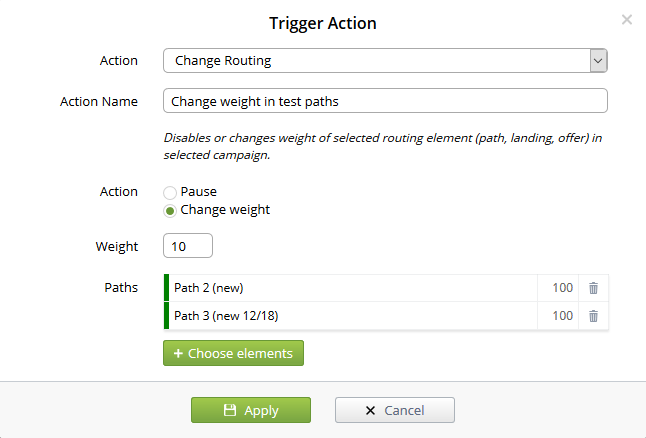 Triggers are the first step to auto-optimization of your campaigns. With properly configured triggers, you can not to be afraid of blocked domains, sudden drops of ROI or LP CTR, disabled offer links and many other abnormal situations. Name - name of your trigger. Group - group of triggers. Object Sleep Time - – the period of time for which this trigger will be switched off after it triggering. Status - the status of the trigger, on or off. 1) Condition - tracker will check if the object meets conditions. 2) Condition + Actions - tracker will check if the object meets conditions and if it meets tracker will perform the action specified in the Actions field. 3) Actions & Notification - tracker will perform the action specified in the Actions field and send configured notification. - Notifications after triggering - Notifications. In this section, you select a specific object to check for a trigger, namely, in what place of the tracker and what data should be monitored. - Specified response by the link (JSON, HTML page, etc.). If trigger meets its conditions, then tracker will perform the action that you specify in the Actions section. Pause Everywhere - - turning off landing/offers in all active campaigns. Safe Mode option instead of disabling just puts weight to 0 for them. The information that your trigger has worked you can receive through notifications. At the moment, you can configure 4 different ways of notifications: letter to email, message to telegrams, SMS or webhook. More information about notifications settings you can see in our article.